Ben Simmons and Kyle Lowry were both ejected with less than 10 seconds to go in today’s Raptors-Sixers game. 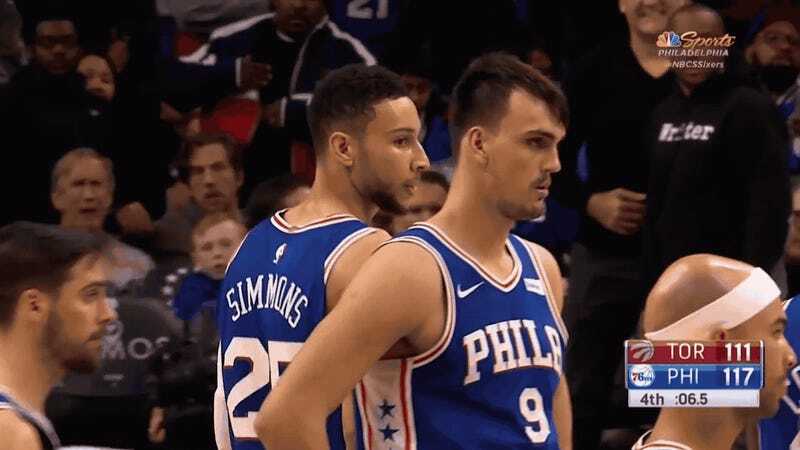 At least on the court, the “incident” looked like a whole lot of nothing, but a little gesture from Simmons as the two went off made it seem like he and Lowry were going to finish their chat in the tunnel. The players who were actually involved were scarce on specifics. Lowry didn’t explain much after the game, saying of Simmons, “I guess he thinks he’s somebody.” Simmons gave a more direct denial that he and Lowry met at all after being ejected. Simmons’s words give some room to believe the story that has Lowry searching for him fruitlessly while the 76er just walked to the locker room, but even if that’s true, this feels like tough-guy posturing without any payoff. That’s probably for the best.